The Complete Barnaby: Coming Soon! Cushlamochree! 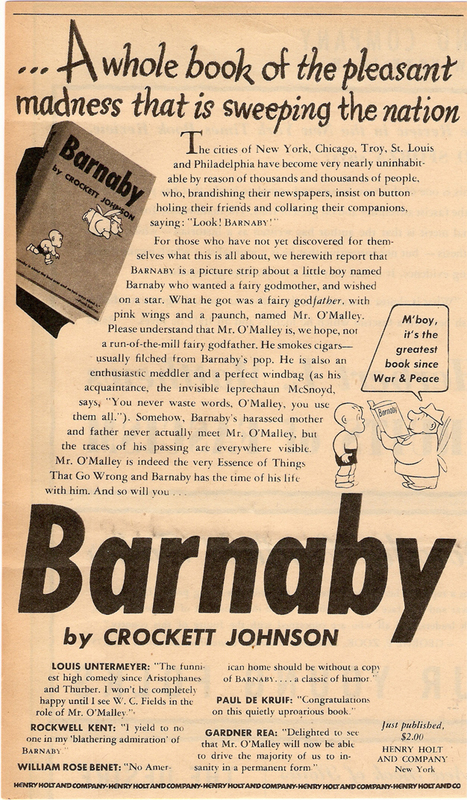 70 years after Crockett Johnson‘s Barnaby made its debut, the entire ten-year run (1942-1952) will be published in full … for the first time! Daniel Clowes will design the books — five in all, the first of which will appear in 2012. I’ll be providing biographical & historical notes. The publisher is Fantagraphics, whose lovingly produced Complete Peanuts serves as a model for the Complete Barnaby. These will be the original strips, and not the redrawn ones that appear in the collections published by Holt in 1943 (see above advertisement, courtesy of the generous Colin Myers) and 1944 — and republished by Dover in 1967 and 1975. A favorite of graphic novelists (today) and of the culturally influential (in its day), Johnson’s Barnaby reflects its author’s wide-ranging interests — political satire, popular culture, classic literature, modern art, and mathematics. Its subtle ironies and playful allusions never won a broad following, but the adventures of 5-year-old Barnaby Baxter and his bumbling con-artist of a fairy godfather was and is a critical favorite. Confessing her love of Barnaby, Dorothy Parker wrote, “I think, and I’m trying to talk calmly, that Barnaby and his friends and oppressors are the most important additions to American arts and letters in Lord knows how many years.” Barnaby’s deft balance of fantasy, political commentary, sophisticated wit, and elegantly spare images expanded our sense of what comic strips can do. With subtlety and economy, Barnaby proved that comics need not condescend to their readers. Its small but influential readership took that message to heart. As Coulton Waugh noted in his landmark The Comics (1947), Barnaby’s audience may not “compare, numerically, with that of the top, mass-appeal strips. But it is a very discriminating audience, which includes a number of strip artists themselves, and so this strip stands a good chance of remaining to influence the course of American humor for many years to come.” His words were prophetic. Barnaby’s fans have included Peanuts creator Charles Schulz, Family Circus creator Bil Keane, and graphic novelists Daniel Clowes, Art Spiegelman, and Chris Ware. And, now that these strips will be available to new generations of readers, here’s hoping that Barnaby continues to influence and delight creators and fans of comic art! For more on this news, check out Tom Spurgeon’s article in today’s Comics Reporter.